Well… Lets see how much we know about Internet and Computers. The idea is to provide knowledge to the TechReaders.com visitors in order to make them more aware of the technology. We will try to arrange this kind of quizzes every week. That also depends on the response we get. Please do let us know how much you scored. My score doesn’t count, because I made this quiz :). You will be provide with the answers and their explanations as well at the end of the quiz. 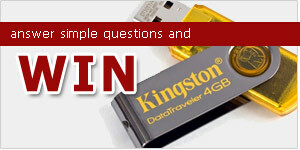 We will randomly pick a comment after 5 days from now and send a 4 GB Kingston DataTraveler*. The more you comment, the more you have chances of winning the USB Stick. You don’t need to get 10/10 to win. The winner will be picked randomly, even if he/she scored 0/10. DO NOT TELL THE ANSWERS IN THE COMMENT. JUST WRITE HOW MUCH YOU SCORED. 48 Responses to "Quiz: Internet & Computer – Win 4GB Kingston DataTraveler"
I learned something. Good quiz. 10/10. Good step taken Zaheer! Its good for beginners. Hope to see some complicated Quizzes in future. Now am waiting 4 ur gift…. 10/10. That’s a good start. great step for teaching people .. This is very good… People can learn and this can answer people who have questions in IT. dear sir where you send my gift there is no one adders bar ya same like that? i scored 10/ 10 🙂 its a good quiz but more n more tech questions shall be asked so that we shake our brain cells fully & get more knowledge !! nice n easy quiz first time saw in pakistan these kinds of activities are good on internet rather than wasting time on chatting. I am very glad to see such a good response. However, we still have to wait for 3 more days to end this quiz. Results will be announced on 30th of this month. This is a good quiz, seriously. I did not know that ROM is permanent memory built into computer, when I took the quiz first time. So I was ‘Excellent’ first time, but ‘Unbeatable’ in the next one! 🙂 There should be more such quizzes with increasing level of difficulty, so that they increase our knowledge. but when prize will meet meEeEeEeE………. The contest will end at 12:00 AM. Few hours to go. Nice Game I think i won so send me my gift………………. according to me the ans is one thousend. any one explane which one is rite ans ? @ vicky: Just take the quiz and and then submit. You will be provided the correct answers + their explanations. For your convenience, One Million is the correct answer. 6\10 not a bad start i thnk…..